Las Piñas 7th Water Lily Festival was held last Thursday, July 19, 2012 at Carnival Court, BF Resort Village, Las Piñas City, under the Water Hyacinth Basket Weaving Enterprise of the Villar Foundation led by its Managing Director, Cynthia Villar, Former Representative of Las Piñas. The Water Lily Festival was conceptualized in order to highlight the products made out of water lilies, which were treated as aquatic pests before as they used to clog the Las Piñas River, but are now useful raw materials quips Mrs. Cynthia Villar. There were fluvial parade, street dancing, musical performances from Manunugtog Kawayan and other local bands, water lily weaving demonstrations and of course, a display exhibit of various handicrafts made out of water lilies during the 7th Water Lily Festival. 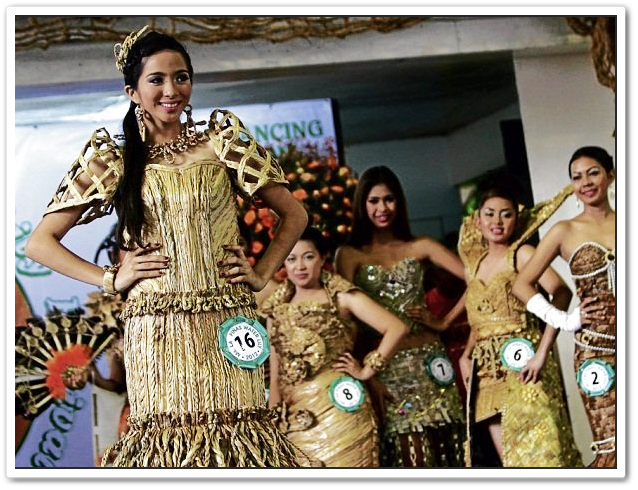 One of the highlights of this year's Water Lily festival is the search for Miss Las Piñas Water Lily. Wherein, each of the 20 barangays of Las Piñas fielded their own candidate. Known designers such as Noli Hans as well as the barangay residents in Las Pinas themselves created the gowns donned by the contestants. The gowns was fashioned completely from dried water lily stalks and leaves, imagine that! This was so exciting! Very Cool! Very innovative indeed and very Filipino! Through this festival, we are able to help the water lily weavers to market their products by showcasing them throughout the day-long festival, from the beautiful gowns of the contestants in the Miss Water Lily to the decorations of the boats in the fluvial parade,” said Former Representative Cynthia Villar who's name had become synonymous with water lilies and green social enterprises. The winners of Las Piñas Miss Waterlily 2012 search are: Grand Winner Lyra Velchez of Barangay Manuyo 1; First Runner-up Angelica Prieto of Barangay Talon 2; and Second Runner-up Lady Ann Erlano of Brgy. BF International/CAA. 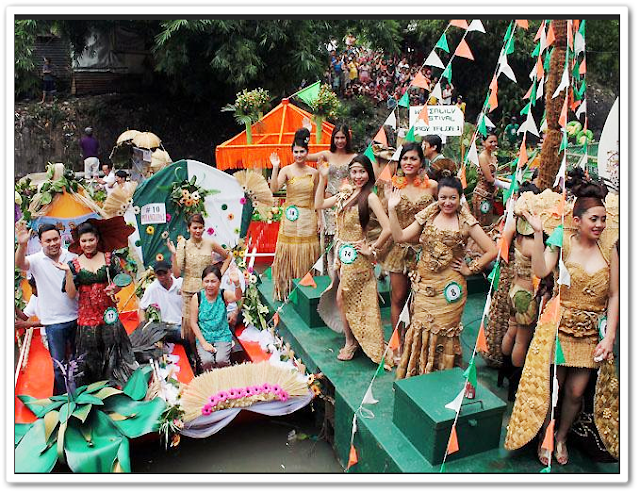 The winners of Miss Las Piñas Water Lily become ambassadresses of the city, they get invited in various events and festivals all over the country to represent the beauty of the city as well as its environmental and livelihood programs such as the United Nations (UN) award-winning river rehabilitation or Sagip Ilog program—a brainchild of Mrs. Villar. Grand prize winner Lyra Velchez (No. 16) receives her prize from Mrs. Cynthia Villar and Congressman Mark Villar. 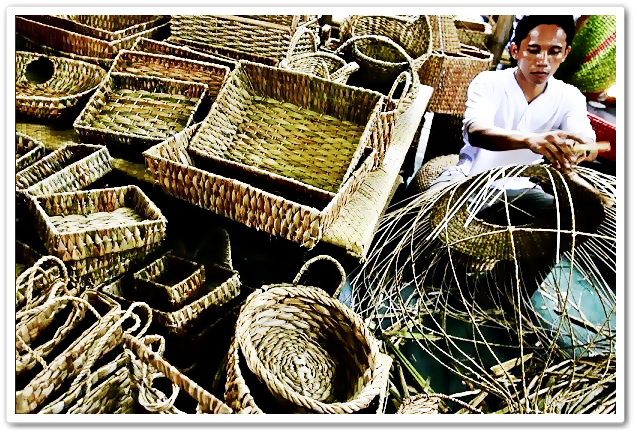 The water lily handicraft business in Las Piñas City started as a backyard industry nearly a decade ago. 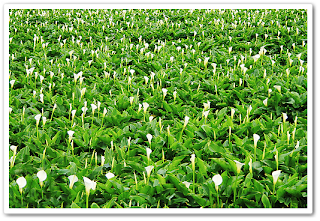 People can't help but take notice of the wide range of products that can be made out of the plant that grow in abundance in urban waterways. These included baskets, trays, chests, bags, traditional bags called bayongs, hampers, cabinets, lamp shades of different shapes and sizes and even a dining table complete with chairs. The smaller items range from coasters to slippers. The water Lily had now evolved. Its products now ranges from handicrafts to wearable arts and gowns. They now weave water lily to something wearable. Thursday’s Water Lily Festival in Las Pinas was both a trade and a fashion show highlighting the business potentials of the plant that grows in abundance in local waterways. With creativity, you can do a lot with water lilies aside from providing livelihood for hundreds of families in Las Piñas, the water lily business has also cleaned up the city’s waterways. 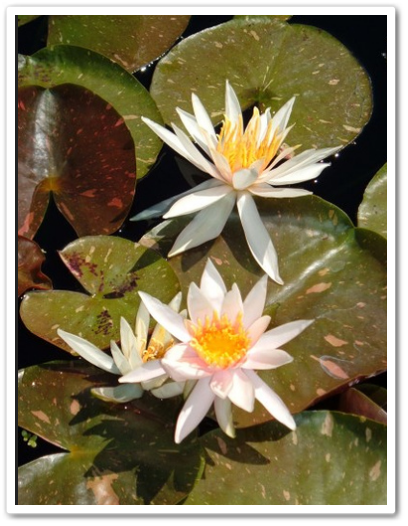 Zapote River is now free of water lilies and fish had begun breeding there again. They are now getting their water lilies from the Laguna de Bay. Mrs. Cynthia Villar hopes that the Laguna de Bay lake will also be cleared of water lilies because of this business. exporters who bought products from the Villar Foundation shipping them to the United States, Europe, and Japan. Hampers sell for P750 and P900 each,depending on the size. Trays sell for P100 to P200 each. Dining set made up of a table and four chairs (with metal or wooden supports) would be worth P25,000. The Water Lily festival not only promotes Las Piñas as a city and draws the attention of the people to our environmental and livelihood programs. “We are proud of the barangay-based livelihood projects that we have created, the raw materials of which all come from wastes. We have employed more than 500 families in our livelihood centers,” cited Mrs. Villar. The Villar Foundation water lily products has a gross selling price P100,000 per month which increases during the Christmas season, when orders for popular Christmas gifts like baskets, trays, and ornamental pots shoot up. Right now, the Villar Foundation is developing charcoal from dried water lily stalks. And they're now looking at using the stalks and leaves as a leather substitute to be used in bags according to Mrs. Villar.